Starting on February 1, if you want to listen to Apple Music on American Airlines, you don't have to buy Wi-Fi to do so. Apple and American Airlines has announced that Apple Music subscribers can listen to their music on any domestic U.S. flight with Viasat satellite Wi-Fi, free of charge. American Airlines is the first commercial airline to provide access to Apple Music through complimentary inflight Wi-Fi. "For most travelers, having music to listen to on the plane is just as important as anything they pack in their suitcases," Apple's Vice President of Apple Music Oliver Schusser said. 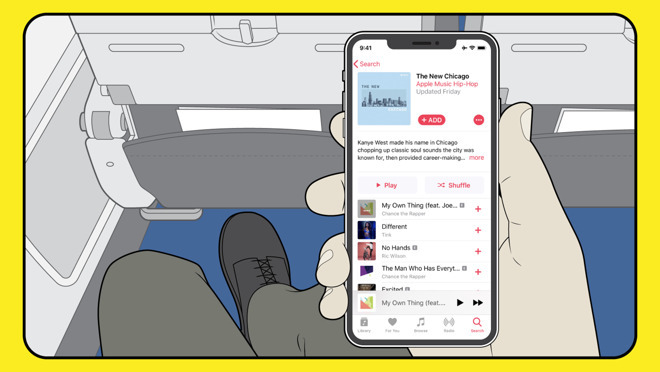 "With the addition of Apple Music on American flights, we are excited that customers can now enjoy their music in even more places. Subscribers can stream all their favorite songs and artists in the air, and continue to listen to their personal library offline, giving them everything they need to truly sit back, relax and enjoy their flight." Streaming is limited to your personal library, the global Beats 1 stream, or curated playlists. Search of the larger Apple Music library isn't free, but can be performed on a paid Wi-Fi connection. To enjoy Apple Music during flight, customers on Viasat-equipped aircraft can connect to the portal page on the in-flight Wi-Fi at no cost and log in with their Apple Music subscription. Customers who don't already have an Apple Music subscription can get Apple Music, sign up onboard and receive free access for three months. I’m sure the usual suspects here will trash this service because you only have access to your personal library or curated playlists but this is the kind of thing that separates Apple from the rest of the crowd. One could ask why Spotify or the other also-rans didn’t think of this first. My wife and I fly regularly to visit our granddaughter in Phoenix and we usually fly either American or Southwest. This announcement will steer us to American more often. I’m a big user of iCloud for my music library and have almost nothing downloaded on my iPhone 8. On the other hand Southwest charges only $8 for a full day of onboard internet (iMessage and WhatsApp can be used for free), their fares are always low, and they will check two suitcases for free. American charges $25 for the first suitcase and $35 for the second, each way. Assuming you only use one suitcase, that's still $50 more on top of a ticket that is bound to cost more than Southwest's low fares, so seems to me you're better off going with Southwest and paying the $16 extra (both ways) which will also get you full internet. Spotify has actually already done this before. You used to be able to stream Spotify for free on Virgin America before they were sold to Alaska Airlines. American Airlines have been charging for wifi/ watching entertainment on your device? So you would rather pay $25 for a checked bag on American than $8 for full WiFi access on Southwest, or do you only travel with carry-on luggage? I'm not sure if you are a regular user of wifi on the airlines, but they all usually go through GoGo Air. Alaska and American use GoGo for their inflight wifi and Apple Music is blocked even with a full Internet subscription. I have an annual GoGo wifi pass and for the last couple of years, you haven't been able to stream or download any Apple Music songs that you don't already have downloaded. This announcement is a big deal and hopefully it means American will stop blocking Apple Music on the paid subscriptions. Except that Southwest uses GoGo for their Wifi Service and GoGo blocks Apple Music even with a paid subscription. So even for $16 you can't get Apple Music streaming on Southwest. Also, people that fly frequently usually have a Frequent Flyer account and don't have to pay anything for checked bags.